We just returned from an epic 10 day family adventure in the San Francisco Bay Area. It was an amazing time with our three kids, ages nine, seven, and four. We saw the sights, explored parks and museums, and ate a ton of ice cream. This post highlights the ten places we tried, and what we thought. 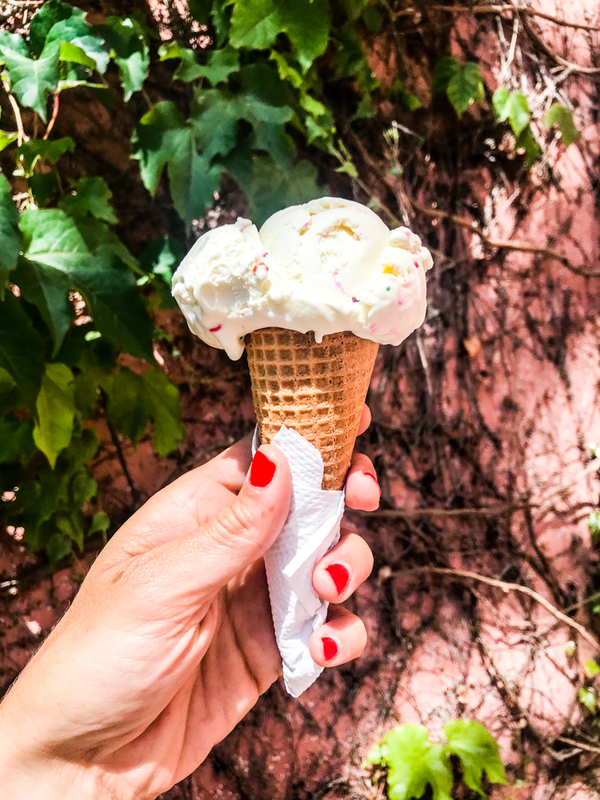 So, the next time you’re looking for a cold treat in San Francisco, you’ll know where to go! This local shop in near Dolores Park in the mission has been one of our favorites for years. The handmade scoops are interesting flavors, all delicious, but the sell-out is the salted caramel that is the best kind of dark, almost burned caramel flavor. There are hand scooped ice cream options as well as daily soft serve specials sold from the walk-up counter. This is a San Francisco must-eat. I first tried this fresh-frozen ice cream back in 2010 when it had just opened out of a shipping container in Hayes Valley. The shop now has two brick and mortar locations, serving up this delicious, light scoops of goodness. The mixed cream and sugar bases are added to a machine with liquid nitrogen to freeze it on the spot. The result is a slightly soft, icey cold and creamy creation. We loved them this time around with the delicious sea salt caramel and chocolate drizzles on top. This Portland, Oregon favorite fits in great in the Bay Area with it’s local-centric flavors. It’s super creamy, boasts a super interesting and ever-changing menu, and the fresh waffle cones are perfect. We have loved it in Portland, LA, and now here in San Francisco. 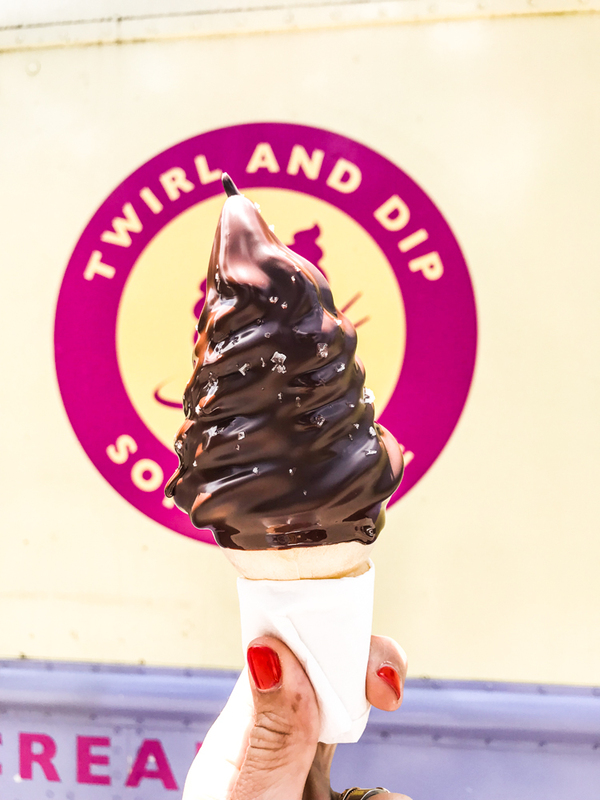 An unassuming food truck parked in the middle of Golden Gate Park, this perfect, organic soft-serve ice cream spot could easily be missed. Don’t make that mistake if you’re nearby. The all-natural, homemade soft serve is unexpectedly wonderful, and it is in the DIP that this place really shines. The soft, dark chocolate coating dries to a fudge, ganache-like texture rather than those more waxy, crispy dips. Plus, with Maldon sea salt sprinkled into the mix the whole experience is elevated to hipster, foodie, gourmet ice cream truck level 10. We are huge fans. Even on my (something like twentieth) trip to San Francisco, we loved visiting Ghirardelli Chocolate factory for a mammoth banana split and brownie sundae. The cool table seating allows for a break from walking in the heat, my kids loved the small visual mini-museum of how the chocolate is made, and we all dug deep into the classic soda-fountain style treats. As a bonus, the corn hole play sets on the outside patio were super fun, too. Okay, this is the one I had on our list that we didn’t quite make it to, but I had so many recommendations to go I wanted to include it. It will be one of my first stops on my next visit to eat ice cream in San Francisco. I hear the basil float is life-changing, so put that one on your list. 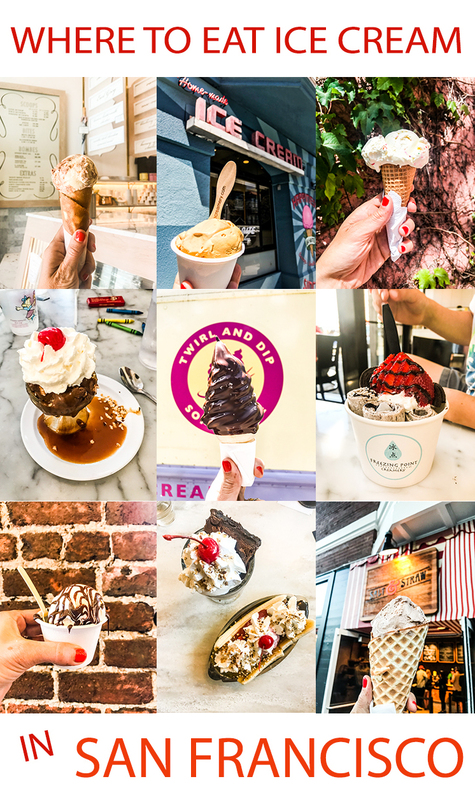 This old fashioned Oakland ice cream joint is family-friendly and casual, offering a whole menu of food as well as the desserts, although we stuck to ice cream sundaes and milkshakes. The flavors are classic and the experience was laid back and fun. We dropped into Ici on a last-minute recommendation from a friend, and I’m so glad we did! Despite the sort of random ambience and stand-offish employees, the unique, boutique, more icey flavors were some of my favorites and the hand-rolled waffle cones with a chocolate tip were as amazing as the ice cream itself. If you’re a chocolate fan, get that. It was beyond. Everything we tried was good, though. We have fallen for Thai rolled ice cream, and this corner spot in Oakland was a fun visit. Similar to Smitten above, this liquid ice cream base is mixed and poured fresh, but unlike the machine used at Smitten, this ice cream is frozen on plates and then rolled into thin cylinders, stacked into cups, and topped with berries, mochi balls, and other toppings. We had cookies and cream, which was amazing. We also tried the frozen ice dessert which was sort of like a sticky shaved ice, and it was also awesome. When visiting this cute island, a trip to Tucker’s is a good idea. This historic spot is still serving up handmade flavors to local crowds. The line is constant but moves quickly, and ample seating make it a fun spot for a break from wandering the town. I loved the Butterscotch Swirl and Peanut Butter Chocolate. I know there are hundreds of other places to eat ice cream in San Francisco and the surrounding areas. If you have a very favorite, drop it in the comments below, because I am sure we’ll be back sometime soon!